The Workers’ Party believes that the provision of safe, clean and adequate supplies of water, along with the provision of adequate and efficient sewage services, should be provided as a public good and not used to generate profits. To this end water and sewage services should be financed through central taxation as they have been in Ireland for decades. The abolition of Irish Water. 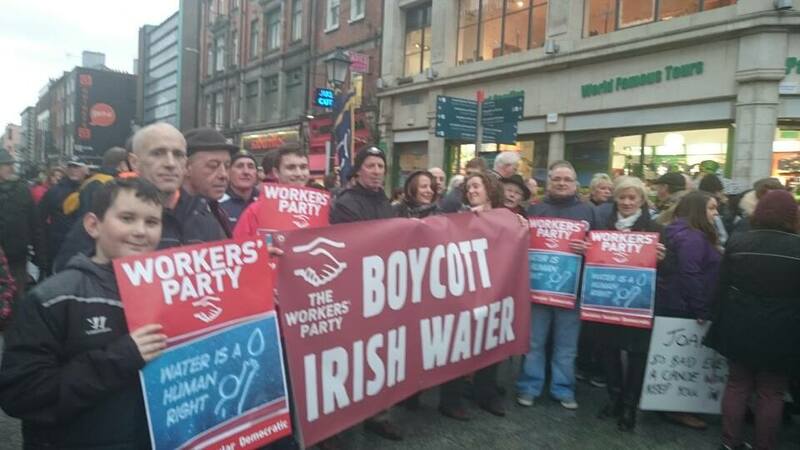 To this end, Workers’ Party activists have played an active role in the Right2Water campaign as well as directly opposing the installation of meters and supporting the boycott of Irish Water bills. Paying for water and sewerage through direct taxation, which is the most cost effective and efficient way of raising revenue for this public utility. Restoring control over water services to the local authorities and ensuring they are adequately funded from central taxation to tackle the long-running scandal of a 40% leakage rate. Holding a referendum so that the public ownership of water and the right of citizens to access water be enshrined in the Irish constitution. All new housing, as a condition of planning, being fitted with rain-water recovery technology, and grant-aid being made available for the retro-fitting of same onto existing housing. The Workers’ Party recognises that there are urgent problems with the water infrastructure in this country. The key problem has been a chronic lack of investment in water infrastructure. Local councils had the necessary personnel, the necessary skills, the detailed local knowledge – but they were starved of funds. Quite deliberately in Ireland, as in other countries, the economic crash of 2007/08 has been used to destroy a public service and to further the privatisation agenda.